Tara tagged me, so here it is! 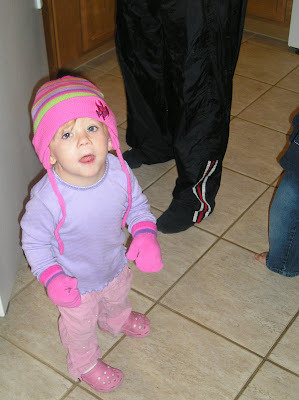 This pic of Mary was October 2007 right before we were heading up to the Leavitts cabin. She's a cutie! The Rules:1. Go to your documents/pictures. 2. Go to your 6th file. 3. Go to your 6th picture. 5. Tag 6 people to do the same. 12. Yep- even you Keri Graves, I know you have a blog! And everyone I forgot and everyone who wants to do this! I think I really botched the rules on this one. Oh well! So I'm sorry I'm not blogging as much these days- just not a whole lot of excitement going on! Oh wait- I had about 30 seconds of excitement last week, so I guess I'll share that with you. So I'm at the drive-thru of a (usually very good) fast food restaurant. The nice lady hands me my drinks in a drink holder, and I sign my card slip. So then I look over, and there is a cockroach running around in my drink holder!!!! So I immediately bolt out of my car and say, "Holy crap, holy crap, holy crap (add a few more times)," go around to the passenger side of my van, somehow get it out of my van (cuz I definitely can't leave it in there! ), and kill it a couple dozen times. Now you must know that there are cockroaches in Mesquite. But right now is not cockroach season. And I do realize that with as many cockroaches that are around here, that of course they probably are at most of the eating establishments around here. But they are usually dead! And I definitely don't want to see one with my food!!!! And there usually is not just one. EW!! Anyway- after I got done doing my "cockroach-killing dance", as it has now come to be known by, the poor lady at the window was like, "Are you okay?!?!" I said that I was, and what I killed that came on the drink holder, and told her that she probably better keep an eye out! Needless to say when I was eating my lunch (I wanted that chicken sandwich REALLY bad), that every bite I took I was just hoping was chicken. And when I was drinking my drink I thought to myself, "That better be ice I just swallowed"!!! Anyway- have a good week.